2005 BMW 545i Sport Package -- LOADED: Navigation, Cold Weather Package, Premium Sound System, Satellite Radio, Xenon Headlights, Parking Sensors, etc. MINT Condition!! ALL Records -- Fully LOADED!! -- 2005 BMW 545i Sport Package, Navigation, Cold Weather Package, Premium Sound System, Satellite Radio, Xenon Headlights, Parking Sensors, Xenon Headlights, etc. Complete SERVICE HISTORY and all work was done by BMW dealer. This is a smoke-free automobile, clean title, clean Carfax History Report and no accidents. The exterior body looks incredible; extra clean and no damages! The interior looks great also, not smoked in and only minimal wear is visible. There are no mechanical issues and all features work as intended. This Bmw drives great, transmission shifts smooth, and it is 100% ready for it's next owner. It is a very well maintained car, that was not abused and always serviced in time. Recently replaced alternator, battery, belts, power steering hoses, oil change, navigation radio, etc. All 4 Michelin tires are good and so are the brakes. This 545i has the 8 cyl 4.4L engine, which makes 325-horsepower and goes from 0 to 60m/ph in 5.4 seconds. Comes with 2 master keys, all manuals, floor mats, tools and emergency kit. Inspections are welcome. Please call (561)-889-2933 for an appointment. NO dealer's fee. Cash Price. We do not offer in-house financing but credit union and other financing institution's checks are accepted. Let us direct you to the right bank if you need help with financing. Trades are welcome and we usually beat most other offers. 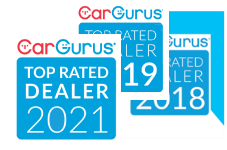 We have been named Top Rated Dealer for 2017, 2018 and 2019 by CarGurus; buy with confidence,​ as our dealership sells superior quality vehicles and provides best customer experience before and after the sale.